Did you know that investing in a simple device—or two—could save you from the headache of water damage from undetected leaks, or even from a burst pipe when you're far from home? Your home represents your single greatest investment, and you treat it accordingly by taking precautions to safeguard against any number of worst-case scenarios. You arm the security system on your way out the door, and you also make a habit of testing the smoke alarms every few months. But if you’re anything like countless other homeowners across the country, there’s one potentially devastating risk lurking in your home that you’ve probably ignored until now—water, more specifically, household leaks. Believe it or not, the Insurance Information Institute recently concluded that between 2010 and 2014, water- and freeze-related damage ranked second on the list of the top causes of property damage. According to the study, more than 2.5 million homeowners have to contend with a leak event each year. What kind of damage are we talking about? The extensive, expensive-to-repair kind. For proof look no further than the fact that the average water damage insurance claim amounts to a whopping $8,000. Make no mistake: “Water leaks can cause severe property damage,” according to Daniel O’Brian, a technical specialist with SupplyHouse.com. Of course, it’s one thing if the refrigerator leaks a few ounces of water onto a tiled kitchen floor. But if the water heater ruptures or a plumbing line fails, the sheer volume of water that ends up where it’s not supposed to go can lead to “effects not only in the immediate leak area, but also in nearby rooms or even on the floor or floors below,” O’Brian explains. What really complicates matters is that leaks often start in areas of the home that don’t get a lot of foot traffic. For instance, if your water heater sits in the basement and you rarely make the trip downstairs, “it might take a while, maybe even a week, before you notice the problem.” Then, as you go about your day-to-day life, oblivious to the leak, the damage gets worse and worse, and the likelihood of mold and mildew growth, wood rot, structural issues, and pest infestation increases by the minute. 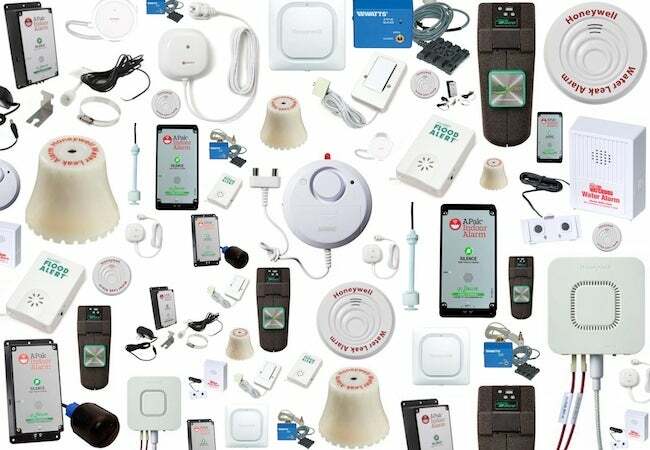 In short, when it comes to protecting your home against leak-wrought havoc, “Nothing matters more than your ability to catch the problem pretty much as soon as it starts.” That’s why experts like O’Brian counsel homeowners to view leak detectors the same way they view smoke alarms—as no-brainer, must-have essentials. Similar to their fire-safety cousins, leak detectors come in a handful of different forms, each with its own pros and cons. Continue reading now for details on the most common options. 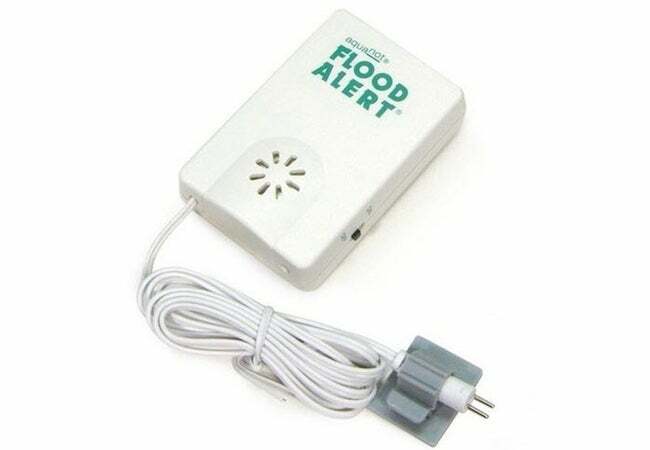 Inexpensive to purchase and a cinch to set up, a basic leak detector like the Zoeller Aquanot Flood Alert features two key components—a moisture sensor and an alarm. 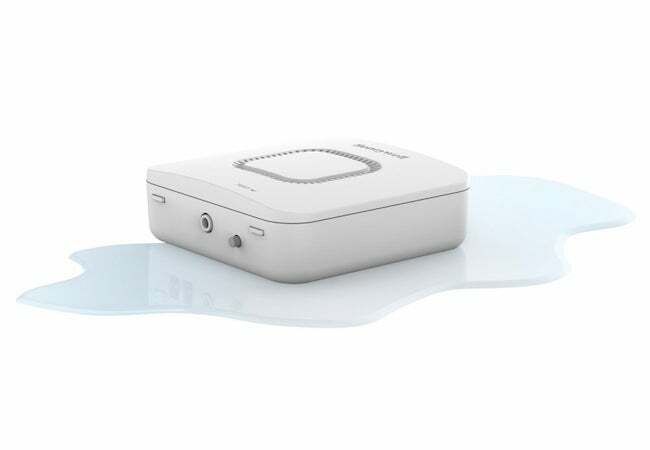 When a leak triggers the sensor, the alarm goes off and continues to emit a loud sound until the sensor no longer detects any moisture. Some basic leak detectors run on batteries while others plug into the wall, but none cost much more than $20. The low price means you can afford to put one in every vulnerable area of your home. There’s just one major drawback. As O’Brian explains, “For this type of leak detector to be effective, someone needs to be at home to hear the alarm.” If you’re not going to hear it until you get home from work hours later—or if there’s no chance that you’ll hear the alarm because you’re away on a week-long vacation—then a basic, audio-only leak detector doesn’t do much good. An internet-enabled leak detector works in much the same way as a basic one, except that in addition to sounding an alarm, a “smart” detector sends an instant notification to your smartphone. Some even sense not only moisture, but freeze conditions as well. 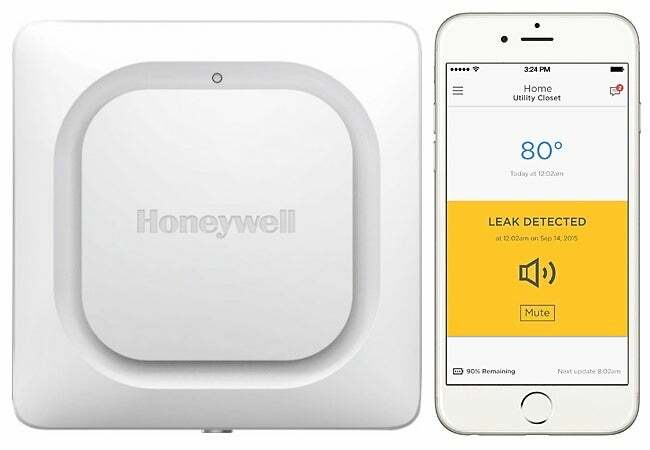 For instance, the Honeywell Lyric Water Leak and Freeze Detector triggers when its four-foot sensing cable comes into contact with either the presence of moisture or temperatures below or approaching 32 degrees Fahrenheit. In effect, it’s a safeguard against both actual leaks and leaks that might occur if a frozen pipe bursts. The best part? “No matter where you are at the time, you’ll know there’s a problem in need of attention,” O’Brian explains. What are the cons? Setup requires more time and effort than with a basic device, and smart detectors cost more—typically about three times more. Given their purpose and historically leak-vulnerable design, water heaters have a reputation for carrying elevated risk. That being so, many decide to install a water heater-specific leak detector. O’Brian notes, “These generally install in the pan that sits right under the tank,” though some models include a cord-like sensor that wraps around the tank itself. 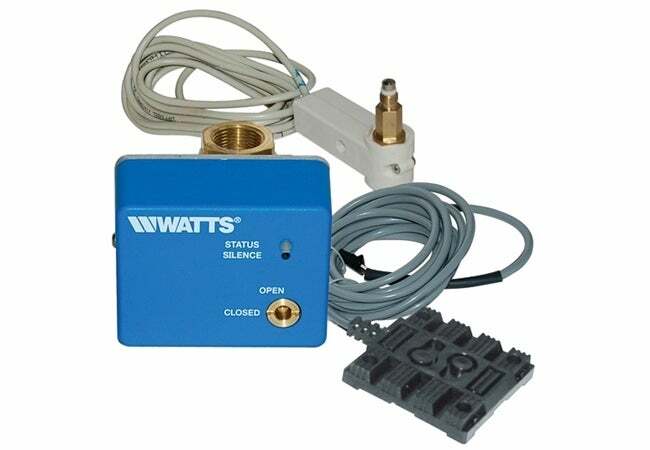 When triggered, a water heater leak detector—the Watts FloodSafe Water Detector Shutoff, for example—actually cuts off the water supply to the appliance. As a specific safeguard against a specific vulnerability, “there’s no better way to go,” O’Brian says. Why? Because without automatic shutoff, a leaking water heater would continue leaking indefinitely, making an already bad situation much worse. You’ll have to pay for that protection, though. Such devices typically cost a few hundred dollars and require professional installation. 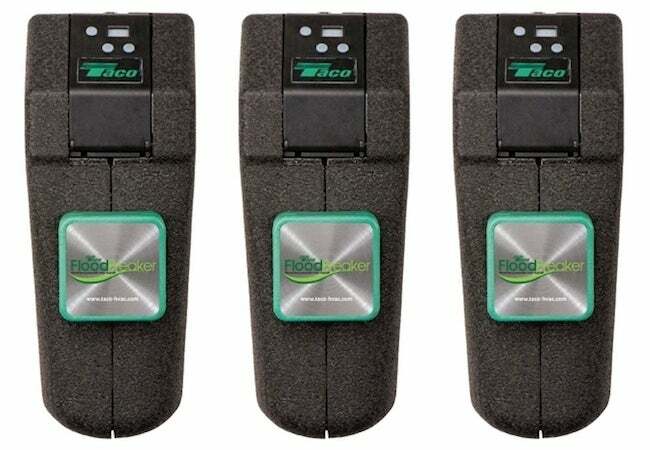 Ultimately, there are many reasons to consider installing a leak detector, and depending on your circumstances, it could make sense to invest in more than one. O’Brian asserts, “If you have an old water heater, live in a house with old and unreliable plumbing, or live in an area prone to flooding, you may want to think seriously about leak detectors.” More broadly, consider the fact that though we all live in close proximity to water—we can even summon it with a twist of a handle or a push of a button!—it never ceases to be a threat to our homes and just about everything in them.